Shopping for Kingdom Hearts Action Figures? Whatcha got there, Donald? SH Figuarts brings you figures from Kingdom Hearts, the smash-hit game series that has sold more than 20 million copies worldwide! 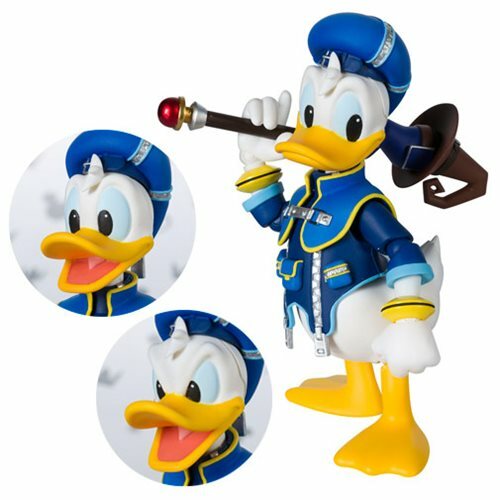 The Kingdom Hearts II Donald Duck SH Figuarts Action Figure features Donald Duck as shown in Kingdom Hearts II. It is highly posable and easy to collect due to its size! The figure includes a weapon, 2x optional face expression parts, 1x optional left hand, and 2x parts of optional right hands. measures about 3 1/10-inches tall. Ages 15 and up.